Amid the World's Strife, the Little League World Series Shines as a Pure Example of Unity, Sportsmanship and Good Clean Fun, Not to Mention Amazing Skill! Throughout the entire competition, Hawaii's manager Gerald Oda could often be overheard reminding his team, "Enjoy this moment," and "Love each other." The LLBWS format features 8 US teams and 8 international teams who compete in their own brackets until the championship game. It's a unique opportunity for these 11 and 12-year-olds to experience not just the thrill of playing the game they love in the beautiful Williamsport, PA facility; but also for the kids to interact with their international peers. And this year seemed especially positive thanks to the focus on sportsmanship even amid some very high-level competition. 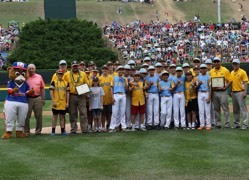 Stephen D. Keener, Little League President and CEO stated, "The amount of sportsmanship, character, and respect that these two teams have displayed throughout this World Series has truly been remarkable and fully exemplifies the values and spirit that the award represents. We are honored to present this award to both teams and hope their display of sportsmanship will continue to inspire local Little League programs around the world." As Hurricane Lane was dousing Hawaii in torrential rain, the Peachtree City Georgia Little League made a donation to the hurricane relief fund for Hawaii. Hawaii's team responded by giving them leis prior to their game, and gave the Georgia manager, Patrick Gloriod, a special lei made of Kukui nuts, which symbolizes 'light' (because he's the 'light' for the kids on his team), according to the Sun Gazette. This year's Little League Baseball World Series was a competition that featured outstanding sportsmanship at every turn, as well as truly fantastic skills—these kids played their hearts out, with 'Web-Gems' worthy of any ESPN viewing. Perhaps Hawaii's manager said it best; "I think that's what Little League's about," Oda told the Sun Gazette, "Even though we're opponents, it's not about hating the other guy. It's about sharing the love of the game." Indeed! Subscribe for free to Breaking Christian News here.